John Deere 4200 Tractor & Backhoe 26HP 4WD Loader 210Hrs! Kubota L2501 Tractor 25HP 4WD Loader 33Hrs! Case IH Farmall 50A Tractor 50HP 4WD Loader 126Hrs! John Deere 1025R, 25HP, 4WD Loader HST 154Hrs! Kubota M8560 CAB Tractor 85HP 4WD Loader 402Hrs!!! 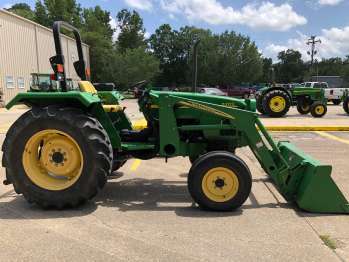 2017 John Deere 4044M Tractor 44HP 4WD Loader 195Hrs!